You may be aware of developers bringing the ‘top trump’ word to planning negotiations – viability. Used to negotiate down the aspirations of planning officers and the residents affected by the development. An example is Wolsey Grange where Taylor Wimpey argued that the application in its original form was not ‘viable’ so they had to increase the number of houses from 350 to 475. Ave. selling price up 8% to £230,000. So an average of £45,676 profit per house or a return of 25% – which in any business is a pretty good rate. If they achieve the same return on Wolsey Grange then they will ‘extract’ £21.7million of profit from the development – I think they must be working to a different definition of ‘unviable’ to the rest of us! After 3 hours of debate the committee voted 8 – 6 to refuse the application but were not allowed anytime to develop the reasons for this refusal despite this being the recommended course of action in Babergh’s constitution. Instead the officers left the council chamber with the developers. After 15 minutes they returned with an ‘offer’ of £50,000 to help ‘mitigate’ against the severe traffic impact. Objectors were not given any time to consider this before being asked to speak again. The committee members were stunned at this turn of events and very little debate ensued. A ‘new’ vote was taken and this time the application was approved by 8 votes to 6. It is not clear how the first vote can be ignored. Do we now keep voting until the officers get the result that they want? Still somewhat shocked by the events of the morning the Wolsey Grange application took a different process with the recommendation for refusal occurring at the beginning of the debate. Many of the reasons for refusal were countered by the phrase ‘experts have not objected’ and therefore those grounds (highways, noise, size of development, etc) were not allowed to stand. We were left with design as the reason for refusal and there are many factors (see below) why this was a valid reason. The vote was taken and the application was refused by 7 votes to 6. However, during the debate a note had been passed to me from a member of Sproughton Parish Council. I knew there should be no contact with the public during the meeting so held the note aloft so that the chairman could see that I had received it but not read it. The paper was folded and remained so. I didn’t read the note at anytime, not even after the meeting, and the note disappeared. So the note had absolutely no bearing on the result. Weeks later the BDC monitoring officer conducted a ‘thorough’ enquiry into the note, though this didn’t include talking to the person next to me. Subsequently the monitoring officer decided that to negate the threat of Taylor Wimpey calling for a judicial review, a new committee would be formed and the application heard again. This new committee were given minimal training and were lead very carefully through the debate by officers – sometimes receiving what I consider to be misleading advice e.g. that cafes, restaurants, fast food outlets, etc are not part of the retail sector. When it came to the vote the application was approved by 13 votes to nil! However during the meeting it came to light that one of the new committee members had received a text which he subsequently read. As it happens it wasn’t anything to do with the application and he eventually reported it to the chairman who announced it to the committee. As we don’t know what the note that I received said, what is the difference between that and the text message that was read? If the first vote had been allowed to stand then Taylor Wimpey would have only had to address some of the design faults and then resubmit it before approval was given. Policy CS7 – “a new community of approximately 350 homes”. Policy CS19 – “in order to promote inclusive and mixed communities all residential development will be required to provide 35% affordable housing”. Wolsey Grange and Belstead House and Meadows will give us 690 units – almost double. This application promised 35% of affordable housing, it is now 20% at best and could end up as low as 6%. Policy CS7 i – “approximately 6 hectares of land to create a quality ‘gateway’ business / employment area”. Policy CS15 iii – “protect or create jobs and sites to strengthen or diversify the local economy particularly through the potential for new employment in higher skilled occupations to help reduce the level of out-commuting, and raise workforce skills and incomes”. Policy CS16 – “an extension in size or intensification of retail uses in the Babergh Ipswich Fringe adjacent to the A14/A12/A1214 will not be supported, to protect the town centre vitality and viability of Ipswich and Hadleigh”. Wolsey Grange offers 4 hectares (not the 6 specified in the plan) of low quality employment as you would expect from the application’s new categories – cafes and restaurants, drinking establishments and hot food takeaways. Babergh consider these activities not to be retail despite the definition of retail being the sale of goods to customers for their own use and not for resale. We have gone from Adastral Park to Cardinal Park. The Impact Assessment identifies that the noise levels are significantly above the ‘serious annoyance’ threshold for external noise and therefore this is not an ideal location for a school. A Commons Select Committee reported in December that new schools should not be built close to main roads. The proposed school location is far too close to the A1214 and the junction with the road into the employment area meaning added dangers, pollution and noise from vans and trucks. Being next to an ‘entertainment site’ is not suitable for a primary school. Lunchtime drinking doesn’t fit with young children in close proximity and the site will also be a natural meeting place for youths in the evening. Access is down a cul-de-sac which will mean that dozens of cars will be trying to do 3 point turns while children are crossing the road and there is even a possibility that parents will stop on the A1214 to drop their children off adding to safety issues. BDC Local Plan 2.8.3.2 – “The A14 and A12 are important communication routes essential to the local economy and congestion at the Copdock junction should not be exacerbated by development in this area”. The reason for the change in employment type in the application was because Highways objected to the ‘severe’ impact of an estimated 600 additional movements on the A1214 from daytime employment. In which case how could around 1,000 extra vehicle journeys from the residential developments, during rush hour, be acceptable? The proposed works to the A1071 and the A1214 will cause months and months of disruption. Adding more junctions to these key routes must add time to journeys and create greater likelihood of accidents. “dwellings will be affected by traffic noise of such an intensity that windows will need to remain shut all of the time. The NPPF and PPG recommend that planning decisions should be avoided where the perception of noise is noticeable and disruptive, such that it has a significant impact. A fence will not mitigate against current traffic noise levels let alone thousands of more journeys per day. NPPF 63/64 – “In determining applications, great weight should be given to outstanding or innovative designs which help raise the standard of design more generally in the area. Permission should be refused for development of poor design that fails to take the opportunities available for improving the character and quality of an area and the way it functions”. IBC says that the “proposed design and specifically the frontage of the development to the A1071 fails to achieve a level of design quality and architectural response for this important urban edge site”. NPPF 150 – Local Plans are the key to delivering sustainable development that reflects the vision and aspirations of local communities. Planning decisions must be taken in accordance with the development plan. This application is contrary to the aspirations of the local communities and the development plan. Our Local Plan spells out the requirements for the Ipswich Fringe – 350 houses (not 690) and 6 hectares of land to create a quality ‘gateway’ business / employment area (not 4 hectares of low quality retail). If there is one thing worse than the pain of air travel it is the pain of queuing on a motorway, and how many times have you said to yourself “well it can only get better” for it then to become worse. So the objective was to get from Okehampton, Devon to St Neots as quickly and safely as possible – I had been on holiday wiith my son, his daughter and her brother. We joined the A30 at noon with 20 miles to go to the M5, it was misty and drizzling. After about 10 miles we joined a queue causing us to start looking for alternative routes – I quite fancied the A303, but thank goodness we didn’t go that way as it was closed for 4 hours. So the M5 it was and as soon as we got onto it the traffic ground to a halt. The next 3 hours were a mile of crawling then two miles of normal speed – we only covered 60 miles in this time. The traffic news advised that the queues were beyond Bristol and also the M42 was at a standstill between the M40 and the M6. Enough was enough, we turned off and headed deep into Somerset. The speed increased but there were many towns en route however we finally got to the M4 before Swindon and the traffic was moving at a good lick. The next choice was either taking the A34 via Oxford or to stay on the M4 and head for the M25 where we new there were queues but hopefully they would be gone by the time we arrived ……… no they weren’t and in fact had spread back onto the M4. However by the time we reached Watford, some 5 junctions later, traffic was moving again but a pit stop was required at South Mimms. 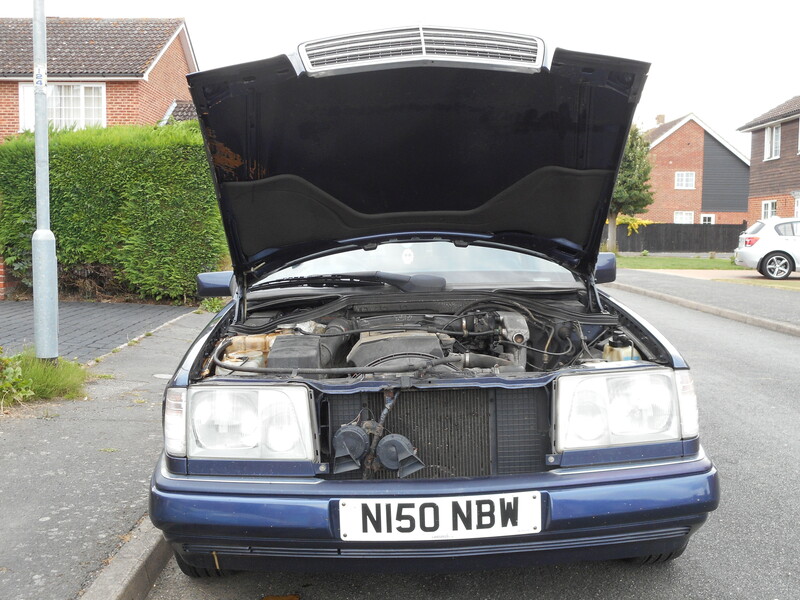 Until this point my old Merc – Mavis – had coped well with the conditions although was running hot in the queues. For some reason when we got going again the temperature just continued to rise. Half a mile from reaching the kid’s home she gave up the ghost spewing her blood everywhere. The RAC were called and about 75 minutes later we were all loaded onto a flatbed and heading home. That should have been the end of the sorry story but, of coure the A14 was closed for resurfacing so a detour through Cambridge and around Newmarket was in order – the final straw. Twelve and a half hours and 340 miles after starting out we were finally home – we could have got back from America quicker! If our population continues to increase at the rate it is our roads are going to fail us, if they haven’t already. Attended my first Local Government Association Conference last week in Harrogate. As you can imagine there was a great deal of blah, blah, blah but a few interesting speakers. Jeremy Hunt, the Health minister, put forward his ideas on how they were going to reduce demand on the NHS. It appears as though it’s all my fault – overweight, a bit of a smoker and I live on my own. So if I give up drinking, smoking and eating the NHS should be safe. Then all of us retired people should move back in with our children to reduce care costs and free up some housing – great in theory but it presumes that you have to got rid of your kids in the first place! John Pienaar gave us his views on the state of the parties after the election – it looks like we could be in for a long spell of Tory rule. Mind you it was interesting watching the ‘group’ of Tories from Suffolk County Council spend 3 days trying to avoid each other. It is a worry for the residents of Suffolk because I just don’t see the quality of Cabinet member required to deliver the services with reduced funds. In two years time, with the Tory Government delivering the peak level of austerity cuts, the County Council elections could deliver a mixed colour administration. I hope that the many Council CEOs that were there spent more time talking with the many exhibitors who seem to have already come up with some innovative solutions – my favourite was the rubbish bin that has its own built-in compactor thus reducing the emptying frequency. Last week I attended my first Cabinet meeting and came away a little concerned. The new cabinet does not seem to have the quality of the last one and there were a number of worrying signs over the council’s finances. One of the recommendations was to increase the budget on the school intervention process by £800,000 in 2015 -16. Since we are still pretty near the bottom of the national league tables this is not a decision to argue with – or is it? The opposition parties suggested this needed to be done back in February but were laughed out of the chamber by the Tories. A touch of ‘we told you so’ is never as satisfying as you would think. But the main issue with the decision is that last year the Children & Young People’s team underspent by over £1.5million so adding an ‘extra’ £800,000 is hardly worth shouting about. When I asked why they were happy to have under spent when the performance is so bad I received the crass comment back from the member for Finance – Richard Smith – that it always preferrable to have an underspend! Really? Surely a child’s education is more important? However, worryingly it either shows a distinct lack of financial acumen or a worrying strategy from the Tory Group. I guess it (a Tory majority) had to happen at some point, just a surprise that in Babergh it took as long as it did – 40 years or so. Working in a ‘hung’ council had its positive and negative points but all of those are preferable to being on the back benches. Time will tell whether a Tory administration is good for Babergh but if the experiences at County are anything to go by then hold on to your hat it could be a bumpy ride. Leader Jennie Jenkins assured those councillors not in the administration (8 Independants, 3 LibDems and 1 Labour) that their views were important and would be sought out, then proceeded to fill all of the policy panels with Tories. Talk is cheap! A message that it would seem fails to reach Tories, both in the District and County, is that their residents would prefer to retain the fabric of their community rather than slavishly follow a zero tax increase and the resulting cuts necessary to balance the budget. Just look around you, in the winter the roads look like a rolling rubbish tip with the lack of greenery exposing huge amounts of litter. Then the growth comes in and covers it up, but this creates blind spots at every rural junction. Now I agree that you shouldn’t have staff levels that are geared to peaks but if you have a rolling peak throughout the year then a bit of flexibility within the workforce could eliminate this perennial problem, that and not trimming contracts so that rubbish is only collected upto 2 metres from the curb when we can all see it up to and including the hedgerow. Beginning to sound like a grumpy old man so I had better stop, but is it wrong to take a pride in our wonderful county?